A CNBC report shares the story of an Work-from-home mom making $5000 every month by just working for 10-12 hours per week. This news report has all the ingredients to go viral on the Internet but the problem is that it is a fake story and the CNBC lookalike site – www.cnbc.com-id.us – is part of part of a big scam. In some cases, the news reports carry fake screenshots of AdSense payments as well as logos of legitimate news organizations. 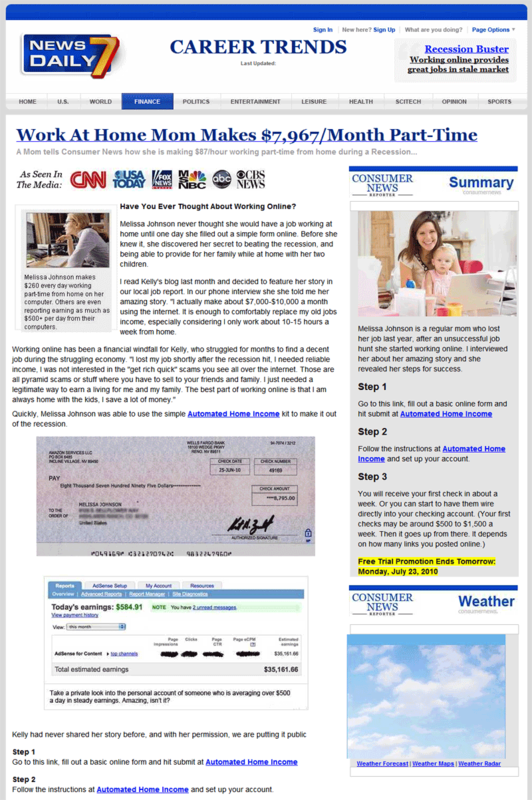 Other web domains that are part of this “work from home” scam include cnb.com, cnbc.com-new.us and www.com-new.us – stay away. You have probably authorized some Twitter app to post tweets on your behalf and thus the only way to stay safe is that you carefully review the list of authorized applications and remove the ones that sound unfamiliar. The cnbc.com-id.us URL is automatically wrapped inside Twitter’s URL shortner – t.co – and it is therefore unfortunate that Twitter spam detection bots have still completely failed to stop this scam from spreading any further.